This week’s Featured Onepager is a hole in one! Moccasin Golf Academy is a golf camp for students 14-18 years old, located in Lakeland, Florida. 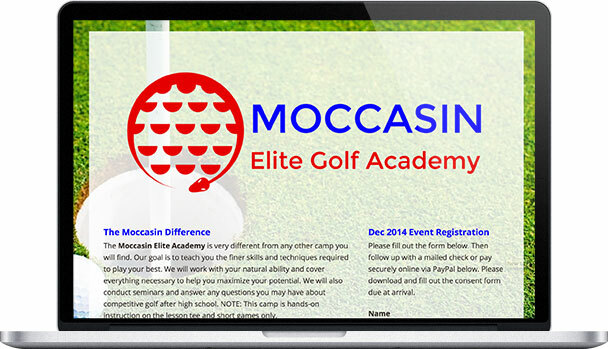 Moccasin’s page is as clean and crisp as freshly cut grass on the first day of the PGA tour. As in last week’s Featured Onepager, Gardening Services WA, Moccasin’s background image is colorful, simple, and a directly representative of its business: golf. The transparent white overlay behind its body text allows the image to come through without distracting the reader from the information. The primary red and blue accents found in the logo, images, and headers break the text into clear sections as well as add visual intrigue to the page. And capitalizing sub-section titles allows Moccasin to further classify information without introducing extra colors, allowing their aesthetic to stay simple and elegant. While the body text takes care of general information about the camp, the sidebar houses information that necessitates a little more interaction, including an event registration form, brochure download, and newsletter signup. They’ve also made use of our Payment feature so that customers can save time and pay online with a PayPal account. This makes things easier for the both the customer and Moccasin—while there’s only one winner of a golf tournament, everyone wins when it comes to streamlined service! 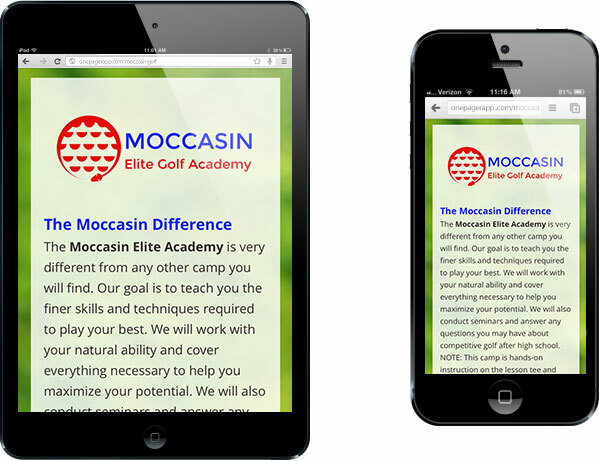 Congratulations, Moccasin Golf Academy, on a site that’s way above par!